Returning to NYC for a second year, Natural's Night Out (NNO) celebrates natural hair and the beauty of men and women of all shades. 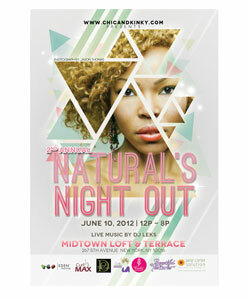 Chicandkinky.com created Natural's Night Out to help women of all shades reinvent the love for natural hair. Hundreds of women will convene at NNO taking place on Sunday June 10th, 2012 from 12 p.m. -8 p.m. The Midtown Loft & Terrace is located at 267 5th Avenue, New York, NY 10016 in the heart of the city. We hope you can join chicandkinky.com and top industry leaders and other inspiring individuals in the natural hair community for this one day empowering event that promises to give attendees the tools and information so they can have confidence in wearing their natural hair. NaturallyCurly will be on location to record all of the action and cover the event online for those who can't be there. Natural's Night Out attendees will gain inspiration from an astronomical line up of some of the most influential people, including Ylorie Anderson of EDENS Body Works, Celebrity Hair Artist, Nedjetti Harvey, Curly Celebrity Stylist, Tameeka McNeil Johnson and many more. Additional Panelist and guests can be found on www.ChicandKinky.com. According to luxurychicmedia, "Natural's Night Out is the perfect opportunity for women who are looking for new ways to reinvent and create styles and care for their natural hair and establish long lasting relationships with other naturals. Natural hair will always be in, but one thing that's always in style are memorable moments with other naturalistas." ChicandKinky.com was created in 2009 to celebrate the increase of natural hair and beauty in women of all shades. It was designed to merge the elevation of natural hair and a fabulous lifestyle. Accepting your hair for each kink, coil and curl is the ideal goal at Chicandkinky.com. This is an event you don't want to miss! Get your tickets now! So, who is ready to book their tickets and travel accommodations for this event?